Carryings On Up The Dale: General d'Armee test game. 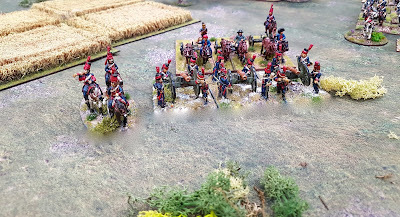 John the Red came over last night to finally have a go with General d'Armee using my French Revolutionary Wars armies. 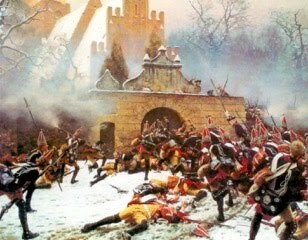 It seemed like a good excuse to 'blood' my early Prussians and pit them against the Revolutionary hoards. 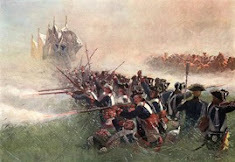 The French had a brigade of cavalry, a brigade of six battalions of average line infantry and a brigade with an elite legere demi-brigade, a battalion of the Volunteers du Midi and a battalion of National Guard. 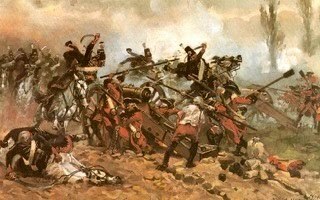 The cavalry had a 4pdr horse battery attached, and the whole army was supported by a battery of 12pdrs. I made the French commander excellent, giving the army an extra ADC. 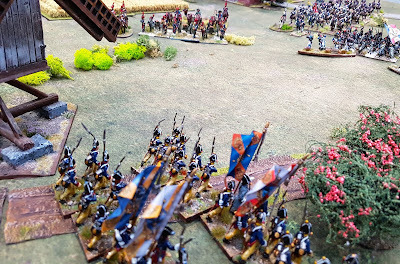 The Prussians also had a brigade of cavalry (two large regiments), two brigades of line infantry and a brigade of fusiliers, supported by a battery of 6pdrs. The Prussian commander was classed as rubbish, so I lost an ADC. 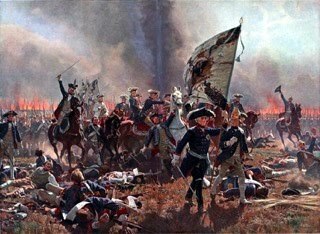 The French were tasked with destroying this Prussian force which was covering the flank of the main army that was in the process of invading France. The Prussians had to hold the French and keep them from exiting the table on their base line. Here are some photos of the action. I was so engrossed in the game I didn't take that many. The Prussian right wing. In turn 1 none of my ADCs were available and two of my brigades were hesitant. A good start! The Prussian left flank. A little 'up in the air'. Seen from the French left wing, the French advance on the right in the distance contrasts starkly with their immobility on the left. 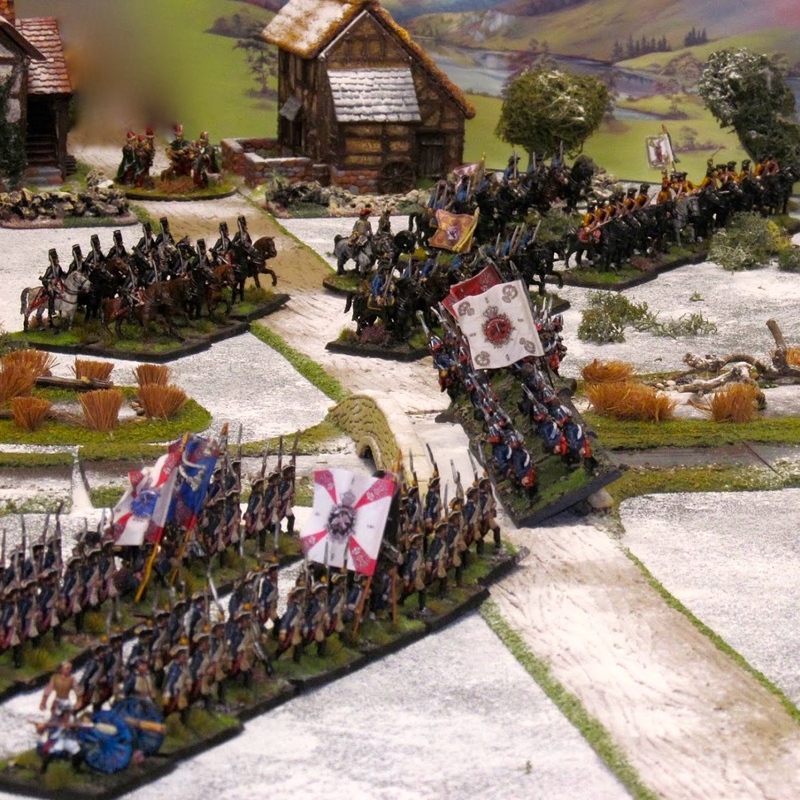 My cavalry - a regiment each of dragoons and cuirassiers (both large) and a unit of Towarczy Uhlans. The Prussian infantry managed to fail all its orders for a number of turns and become/stay hesitant and my few ADCs were busy elsewhere. 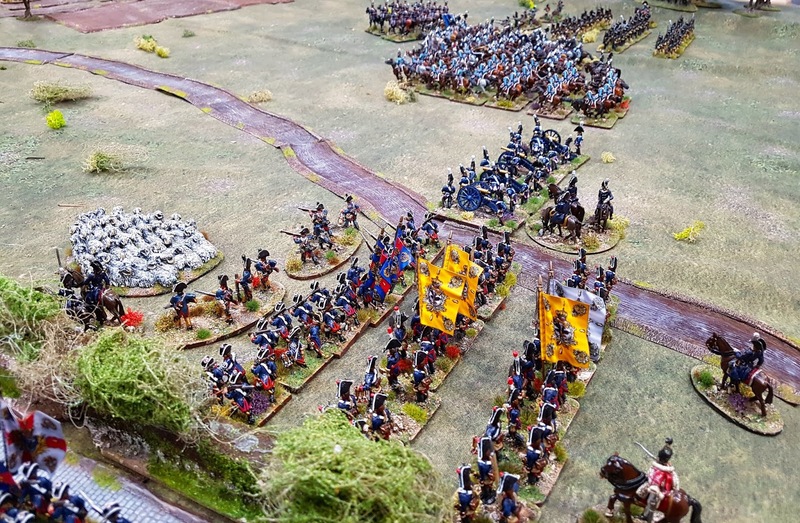 The French had the same problem with hesitant brigades but had four ADCs to play with to my three. I decided to attack with my cavalry as my infantry appeared to be unwilling to do much except enter into a loosing fight with John's skirmish screen. The French artillery was able to knock a few Prussian cavalrymen from their saddles but failed to stop them. The French horse artillery galloped forward and unlimbered on the Prussian flank. 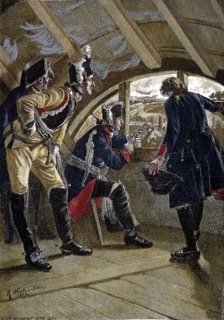 They began pounding my left hand battalions mercilessly. 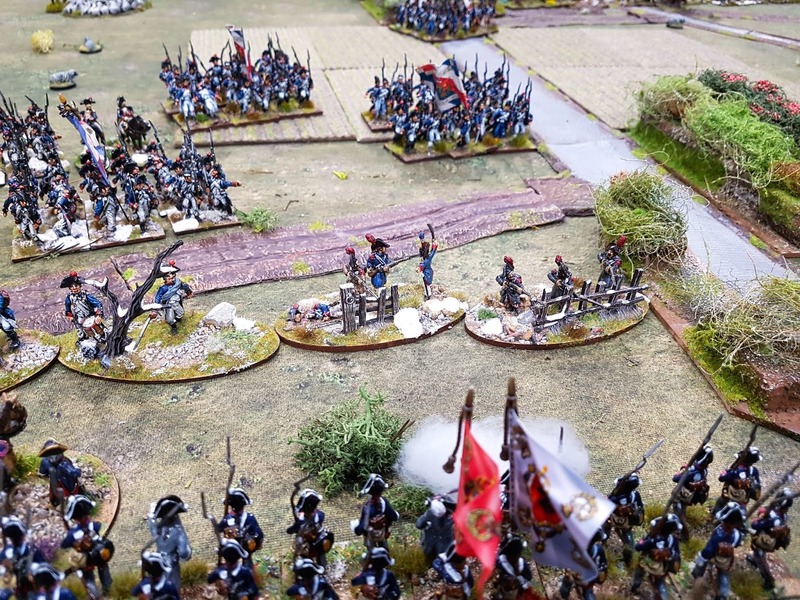 The Prussian left hand battalions being pounded mercilessly! The French cavalry approached. 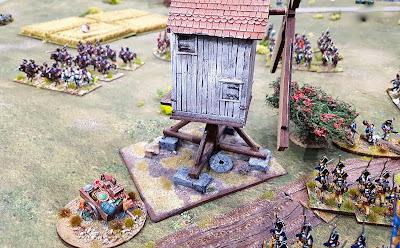 The 8th regiment just behind the windmill were lining themselves up for a charge while the 23rd regiment (aka the damned pinko Parisien ladyboys) worked around my flank. 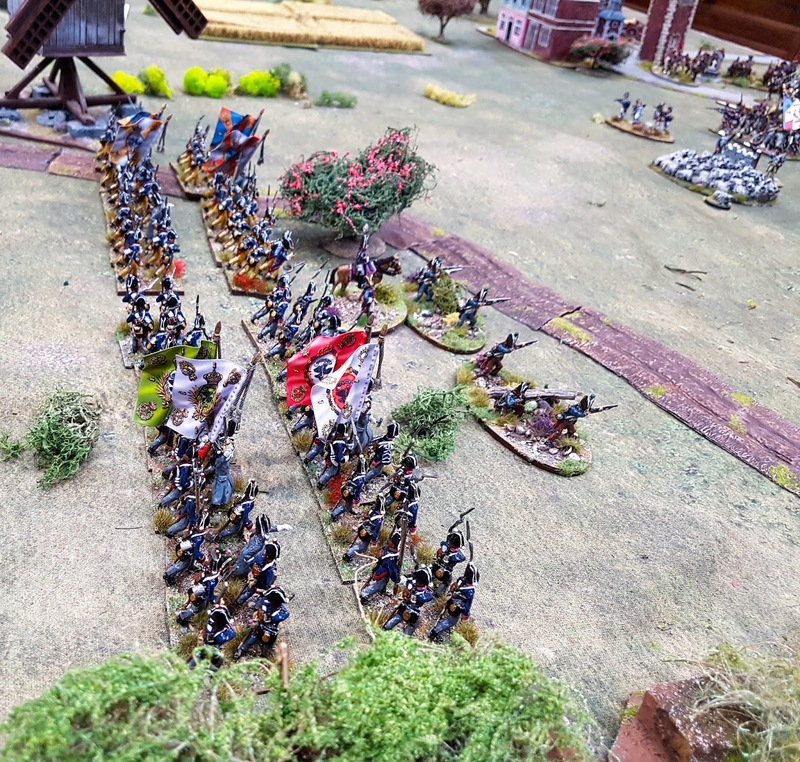 The French were in the process of overwhelming my feeble skirmish screen, which was eventually driven off. John's cavalry then charged my wavering line and routed one battalion, forcing the others in the brigade to withdraw. My cavalry charged John's left wing. In the first attempt they were driven back. 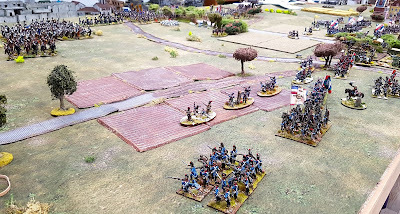 A second charge by the cuirassier alone, supported by the dragoons and Towarczy Uhlans had better luck, riding over and dispersing a battalion of French before being forced to retreat in the face of fresh French infantry. Both our left wing commands were now (if we got the rules right) faltering. My cavalry was battered but still dangerous but neither side was going to be able to exploit the situation quickly. The game was declared a draw, with honours even. As for the rules, I actually am quite taken to them. I had thought on reading them that they'd be very complicated but thats not the case and apart from a few occasions when we had to study the rules to find out what happened next we got into the swing of the game and the mechanics of the rules easily. A certain amount of very careful planning was required when allocating ADCs to ensure 'the master plan' would work which was great and will no doubt become easier when we know the ADC tastings off by heart. I for one am looking forward to trying them again, maybe on a larger scale, although I'm not too sure how they'll work with multi-player games. I guess I shall have to find out. Wonderful looking game Colin and like yourself, I very much enjoy these rules. Looking forward to getting another game in myself shortly. 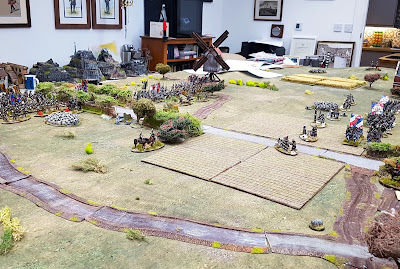 great game Colin, Nice to see early war Prussian on the table. We have used General D'Armee here is South Australia for about 6 months now. Having done about 12 games, I find they give a very good game. Thanks for the review and AAR....how long did it take you to play your game Colin? Thanks Stuart. Around two and a half hours. I’ll stick to BP thanks, don’t want my brain dribbling down my nose trying to follow GdeB. Nice looking game though, especially the sheep skirmishes in the first picture! I still like BP but these rules were quite straightforward and less abstract. Thankfully very little of my brain left. 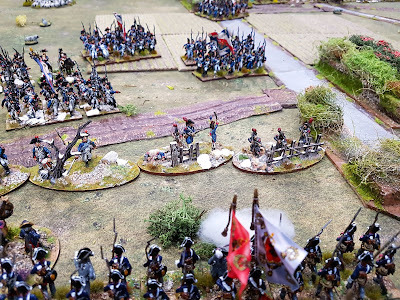 Great to see you getting the chance to put all your beautifully painted early Napoleonic figures on the table Colin. I will be interested to see once you get a few games under your belt, whether these will start to replace BP for you. 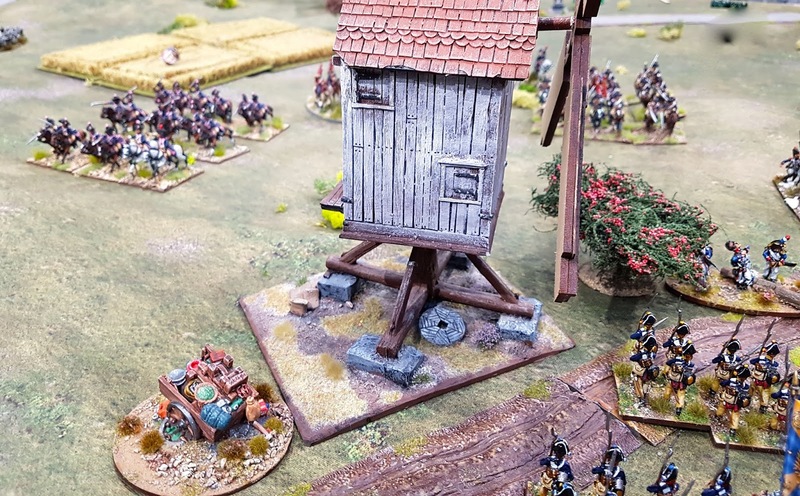 Great looking game as usual Colin , but those early Prussians are rather special. Thanks Jan. 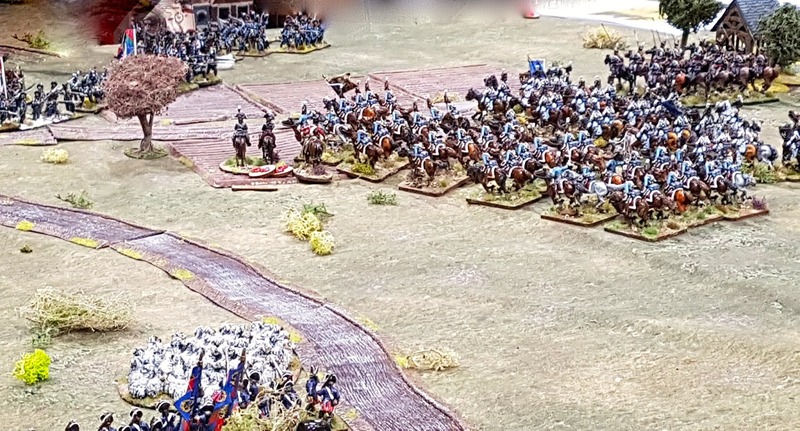 Yes, some of the Prussian infantry are Foundry (top picture). The cavalry are Elite and the other infantry are from FGMiniz. The artillery are also Foundry. 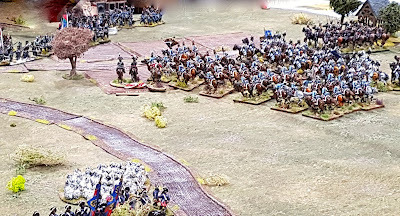 There’s a company called Three Armies who do 1806 Prussians which are rather nice and less expensive than Foundry. Looks great, tends to work best with at least 5-6 ADC's per side I find.